The past fifteen years have seen Indonesia move away from authoritarianism to a thriving yet imperfect democracy. During this time, the archipelago attracted international attention as the most-populated Muslim-majority country in the world. As religious issues and actors have been increasingly taken into account in the analysis and conduct of international relations, particularly since the 9/11 events, Indonesia’s leaders have adapted to this new context. 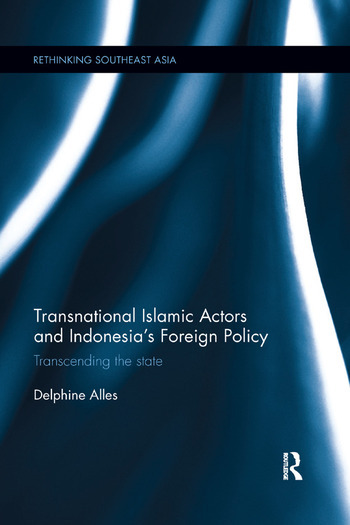 Taking a socio-historical perspective, this book examines the growing role of transnational Islamic Non-State Actors (NSAs) in post-authoritarian Indonesia and how it has affected the making of Indonesia’s foreign policy since the country embarked on the democratization process in 1998. It returns to the origins of the relationship between Islamic organisations and the Indonesian institutions in order to explain the current interactions between transnational Islamic actors and the country’s official foreign policies. The book considers for the first time the interactions between the "parallel diplomacy" undertaken by Indonesia’s Islamic NSAs and the country’s official foreign policy narrative and actions. It explains the adaptation of the state’s responses, and investigates the outcomes of those responses on the country’s international identity. Combining field-collected data and a theoretical reflexion, it offers a distanced analysis which deepens theoretical approaches on transnational religious actors. Providing original research in Asian Studies, while filling an empirical gap in international relations theory, this book will be of interest to scholars of Indonesian Studies, Islamic Studies, International Relations and Asian Politics. Delphine Alles is Professor of Political Science at Université Paris-Est, France and teaches International Relations and Asian Politics at Sciences Po Paris, France. She is a researcher at LIPHA (Hannah Arendt Interdisciplinary Institute for the Study of Politics, Université Paris-Est) and IRSEM (Strategic Research Institute of the French Military Academy).